Matt Damon is an American screenwriter, producer, and actor, who is best known for his role as Jason Bourne in the Bourne series of films. He gained national attention after the success of Good Will Hunting, a film that he and his good friend, actor Ben Affleck, co-wrote. The film went on to win the Academy Award for best screenplay that year. Damon is also a philanthropist who founded the H20 Africa Foundation, and supports many others such as the ONE campaign and Feeding America. He is married with three daughters and a stepdaughter. Damon stars as astronaut Mark Watney in this science-fiction drama directed by Ridley Scott, based on the book by Andy Weir. Watney, mistakenly left for dead on Mars, has to survive for four years with only limited food, oxygen and other supplies. Co-starring Jessica Chastain, Jeff Daniels, Kate Mara, Kristen Wiig and Sean Bean. When we made the movie, we had to go through step by step. He [Watney] is very logical and practical and methodical in how he goes about surviving. He says, essentially, ‘I need air, water, and food, and what do I need to do to ensure I have those things?’ And then kind of lets the science bring you there. Damon acts out scenes from his films with Corden on The Late Late Show. In an interview with DeGeneres on The Ellen Show, Damon defends comments he made in The Guardian about gay actors. I was just trying to say actors are more effective when they’re a mystery. Right? And somebody picked it up and said I said gay actors should get back in the closet. Which is like I mean it’s stupid, but it is painful when things get said that you don’t believe…In the blogosphere there’s no real penalty for just taking the ball and running with it,” Damon said. “You know what I mean? You’re just trying to click on your thing. So. It’s just like any piece of gossip… and it put us in a weird position of having to answer, you know what I mean? Which was then really deeply offensive. I don’t want to, like [imply] it’s some sort of disease—then it’s like I’m throwing my friends under the bus. But at the time, I remember thinking and saying, Rupert Everett was openly gay and this guy—more handsome than anybody, a classically trained actor—it’s tough to make the argument that he didn’t take a hit for being out. I think it must be really hard for actors to be out publicly. But in terms of actors, I think you’re a better actor the less people know about you period. And sexuality is a huge part of that. Whether you’re straight or gay, people shouldn’t know anything about your sexuality because that’s one of the mysteries that you should be able to play. The only team that’s left with diversity is the team that announced that they liked this script the most as it is, and that’s Leo and Kristen. Everyone else had major problems with it, with exactly the things that you’re bringing up, and exactly the things that we brought up to each other. I think on the surface, they might look like one thing, but they might end up giving us something that we don’t want. And when we’re talking about diversity, you do it in the casting of the film, not in the casting of the show (italics added). Damon plans to reprise his role as Jason Bourne in 2016. It’ll be in 2016 when the movie will actually come out. (Director) Paul Greengrass is going to do another one and that’s all I ever said. I just needed him to say yes. Damon is nominated by Jimmy Kimmel and Ben Affleck and nominates George Clooney, Bono and Tom Brady. Instead of ice water, Damon uses toilet water, to promote Water.org, whose goal is to provide clean water to people around the world. We envision the day when everybody has access to a clean drink of water, and here are about 800 million people in the world who don’t…The water in our toilets in the West is actually cleaner than the water that most people in the developing world have access to. So, as disgusting as this may seem, hopefully it will highlight that this is a big problem and hopefully we can do something about it. 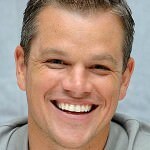 Matt Damon Takes the ALSA Ice Bucket Challenge! Damon plays James Granger in the biographical war drama, The Monuments Men. Set during World War II, a group of art experts form a platoon to save artistic masterpieces scattered across Europe before the Nazis get to them, and find the ones that they’ve already hidden. Co-starring George Clooney, Bill Murray, Cate Blanchett, and John Goodman. It was one of the easiest jobs that I’ve ever taken, in the sense there was no question I was gonna do it from the second it was offered to me. I saw District 9 like everybody, and I freaked out… And so he instantly jumped to the top of the list of people that I wanted to work with. Damon is nominated for Outstanding Lead Actor in a Miniseries or Movie at the 65th Primetime Emmy Awards for portraying Scott Thorson on Behind the Candelabra. Well, leaving the film out of it, it’s a very divisive issue and people feel very strongly one way or another. So for us, we wanted to make this movie about where we are in America right now, so it was really the perfect issue to use as a backdrop for that, to explore those themes, because the film covers where we’ve come from, where we are, and where we’re going, and what happens when big money collides with real people. Damon plays Steve Butler in the drama, Promised Land. A small U.S. town is having an economic crisis. Seeing an opportunity, Butler offers land owners a chance to sell the drilling rights to their properties. However, it isn’t going to be easy for the corporate salesman, especially after he is met with opposition by a local school teacher. We really wanted to make a movie about where we are right now in America and where we’ve come from… and where were headed. Damon plays Benjamin Mee in the family film, We Bought a Zoo. After the death of his wife, Mee and his children need a fresh start. The family moves to the countryside to put all their efforts into re-opening a struggling zoo. Co-starring Scarlett Johansson. You know, I really related to it. He’s just trying to keep his family together at the beginning of the movie. It’s this really life affirming movie. Damon gives an interview to Elle about how changing his bad boy attitude helped his career. The minute people started saying, “He’s the all-American guy,” my career got interesting. It liberated me. Instantly it was an image directors could f-ck with. Damon voices Bill the Krill in the animated children’s film, Happy Feet 2. Being the son of ‘The Master of Tap’ is tough especially if you can’t dance. Disheartened, Erik the penguin leaves his land and sets off on a journey to find his dancing feet. Co-starring Elijah Wood, Pink, Robin Williams, Sofia Vergara, and Brad Pitt among others. Even then you can see in a very, very rough form that it was going to be great, and that it had this really great message. And so I got excited. I think he’s the easiest character to relate to in a lot of ways… Because he’s just a guy trying to keep his daughter alive, and I think any parent can relate to that. Blunt and Damon appear on the cover of the April 2011 issue of Men’s Health Ukraine and Men’s Health Russia magazine. Damon plays David Norris in the sci-fi thriller, The Adjustment Bureau. In the story, the events in a person’s life are already written and if anyone veers off their path, the Adjustment Bureau always makes sure to correct it. All of these change when they meet Norris. After meeting the love of his life, Norris decides to contest the bureau. Co-starring Emily Blunt and Anthony Mackie. I wanted to do the movie because it was unlike anything I’ve ever done. I just loved the idea, and obviously the love story really has to work for the whole other thing to work, for the whole idea for the adjustment bureau to work. It’s a strange thing when you’re acting with somebody who’s that good, you almost don’t have to do anything. He’s good enough for both of you. Damon plays George Lonegan in the drama, Hereafter. Three strangers from the opposite ends of the world are connected to each other in the afterlife in some way. After the most unfortunate events of their lives take place, they rely on Lonegan to explain what happens in the Hereafter. Co-starring Marie Lelay and directed by Clint Eastwood. He’s just a great director. We just have a great thing going. We love working together and I think we have similar instincts about making movies. Damon is nominated for Best Supporting Actor at the 82nd Academy Awards for portraying Francois Pienaar in Invictus. To be directed by Clint Eastwood everyday and to sit across the table from Morgan Freeman and watch him do what he did was a dream come true. I’m so grateful that this role came my way. Damon plays Francois Pienaar in the biographical drama, Invictus. In his first term as President of South Africa, Nelson Mandela turns to the sport of rugby to unite his nation. He teams up with the Captain of South Africa’s rugby team and encourages him to lead the others to world cup victory. Co-starring Morgan Freeman. I’ve met most of the guys on that rugby team, and they all knew what was kind of being asked of them. It’s a really wonderful moment in that country’s history. Damon plays Mark Whitacre in the drama comedy, The Informant! A company is being investigated for price fixing by the FBI and they needs eyes and ears inside the corporation. So the Feds’ convince bi-polar Whitacre, who is in upper management, to spy on his company for them. Co-starring Tony Hale. It’s another one of those things as an actor that I’ve never been asked to do… There were so many little things. It was fun kinda putting the character together. 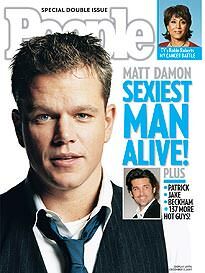 Damon appears on the cover of People because he was listed as the sexiest man alive. You gave an aging suburban dad the ego boost of a lifetime. Damon plays the role of Jason Bourne once again in The Bourne Ultimatum. After British reporter Simon Ross unveils secrets of Operation Blackbriar and Treadstone, Bourne schedules a meeting. Bourne believes he holds the final answers to his past, but will have to evade the CIA once again to get to the Blackbriar documents. Co-starring Joan Allen and Julia Stiles. The great thing about Bourne is he’s so good at so many things, that I get a different stunt double for every possible…I’ve had more guys double me in these movies. Damon reprises his role as Linus Caldwell in the crime thriller, Ocean’s Thirteen. After crew member Reuben Tishkoff is double crossed on his new casino investment, Danny Ocean and company set out to ensure the casino fails on opening night. This time around, it isn’t about money, but revenge. Co-starring George Clooney, Brad Pitt, Andy Garcia, Al Pacino, Scott Caan, and Casey Affleck. One good byproduct of these movies being so successful is that we get to go off and do other movies in between. So to get all eleven of us in the same place in the same time is tough. It was a very subtle performance and that was by design, and that was all Bob. And I don’t know if I would have done it quite that way had it not been him. Damon plays Colin Sullivan in the crime drama, The Departed. Two fresh graduates from the Massachusetts Police Academy traverse two different sides of the law. Billy Costigan must work undercover and infiltrate mobster Frank Costello’s gang, and Sullivan who works for Costello, is the mob’s eyes and ears in the police force. The two officers race to find the identity of one another. Co-starring Leonardo DiCaprio, Mark Wahlberg, and Jack Nicholson. I did all this research and went with the state police and did everything from listening in on a wire to observing under-covers, to buying drugs. Damon plays Bryan Woodman in the drama, Syriana. After a U.S energy plant in the Middle East loses drilling rights to a Chinese competitor, the plant merges with a smaller company in Kazakhstan. Full of corruption and politics, the film parallels the stories of four men deeply involved in the oil industry: a CIA agent, a lawyer, an energy analyst, and an immigrant worker. Co-starring George Clooney, Amanda Peet, and Christopher Plummer. It’s the kind of movie that you plan to go out and have a drink or cup of coffee afterwards and talk about it. That’s kind of the point. I think Matt really encompassed Will and the con-artist in Will brilliantly. He did charm the pants of people. Damon plays Linus Caldwell once again in the crime thriller, Ocean’s Twelve. Casino owner Terry Benedict has found Danny Ocean and his crew and demands his $150 million back, with interest. To pay off the debt, Danny and company head to Europe to steal the priceless Fabergé Imperial Coronation Egg. Co-starring George Clooney, Brad Pitt, Andy Garcia, Julia Roberts, Catherine Zeta-Jones, Scott Caan, and Casey Affleck. It became a pretty tight-knit group of guys. We had a really great time working together, traveling together. It’s a very easy ‘yes’ when the phone rings. Damon reprises his role as Jason Bourne in The Bourne Supremacy. Just when he thought he escaped the horrors of his past, Jason Bourne is framed and must fight for his survival again. Bourne has since discovered that CIA black-ops group Treadstone is behind everything, and will not stop until he is finally terminated. Co-starring Julia Stiles, Michelle Monaghan, and Joan Allen. I really like the character. I kind of feel that I’m in the same position that I was in in the last one now, where I’d like to do a third one but I don’t want to do it if it can’t be as good as the second one. Damon plays Bob Tenor in the comedy, Stuck on You. Bob and Walt are conjoined twins who do not let their handicap get the best of them. When Walt decides to make his dream of becoming an actor a reality, the duo make their way to Hollywood. But Bob’s shy personality may be what’s holding Walt back. Co-starring Greg Kinnear and Eva Mendes. We have similar senses of humor. At least he makes me laugh and I think I bring other things to the friendship. Damon plays Jason Bourne in the action thriller, The Bourne Identity. The film tells the story of a man who wakes up with no memory. He discovers that his name is Jason Bourne and there are people that want him dead. Bourne must use the clues tied to his past to figure out why he is being hunted. Co-starring Clive Owen and Julia Stiles. I trained a lot in martial arts and in boxing and in firearms training, just so that would inform the way I stood, or the way I listened to people, or the way I looked at people. Damon plays Linus Caldwell in the crime thriller, Ocean’s Eleven. I team of burglars and con men led by Danny Ocean set out to do the biggest heist of their lives – rob the three busiest Vegas casinos in one night. There’s $150 million on the line and casino owner Terry Benedict will not go down without a fight. Co-starring George Clooney, Brad Pitt, Andy Garcia, Julia Roberts, Scott Caan, and Casey Affleck. We all had such a good time there. We had a good time with each other. I think at the heart of him is this tremendous loneliness, and I think that’s something that’s universal. It was something I really could relate to and really connected to when I first read the script. Damon plays Private Ryan in the war drama, Saving Private Ryan. After a family loses three of their boys in World War II, a group of soldiers must find the last surviving son who is in Nazi-occupied territory. The squad have different opinions of whether or not they should save the Private, since it means risking their own. Co-starring Tom Hanks, Tom Sizemore, Edward Burns, Barry Pepper, and Vin Diesel. Directed by Stephen Spielberg. I know when I saw it I had this visceral reaction to the combat because it doesn’t pull any punches. Matt and I had identical interests, so whether we ended up successful or making hot dogs at Dodgers games, we knew we’d end up doing the same sort of thing. Damon plays Ilario in the war drama, Courage Under Fire. Before the Congressional Medal of Honor can be awarded, U.S. Army officer Nat Serling must investigate whether Captain Karen Walden deserves it. She will be the first female to receive the award for her heroics during Desert Storm. However, as Serling does a little digging, parts of the story do not add up. Co-starring Denzel Washington and Meg Ryan. I remember when the movie came out and I wasn’t even mentioned in the reviews because I hadn’t really been in the press notes… I remember feeling like I had given so much for that role, and my name wasn’t even in the paper.